Jim Binson contends his Western American art collection, which includes thousands of paintings, sculptures, drawings, photographs, and rare books, rivals that of most museums. But he has no interest in pioneering a traveling exhibit. The Binson family, which operates six home health-care stores in metro Detroit, as well as two in Florida, has long had an affinity for creativity. Jim’s father, S. George Binson, a U.S. Army sergeant and medic, was a contributing cartoonist for Stars & Stripes magazine while on assignment in North Africa during World War II. Touring the company’s headquarters is like visiting an art institute — only at Binson’s, nearly every nook and cranny is filled with a painting or sculpture. 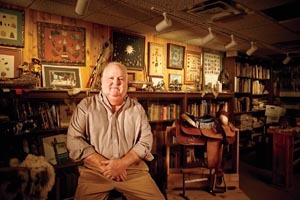 Amid the company’s offices, set atop Binson’s main store, paintings of cowboys, explorers, hunters, and frontiersmen abound, including works by Michigan artists Bill Rose and David Bowman. Down a narrow hallway, Binson, 67, points out his collection of cartoons, both political and comical. One depicts President Richard Nixon with outstretched hands, trying to hold the Middle East together. On the lighter side, there are old standbys like Lolly, Funky Winkerbean, Beetle Bailey, and Alley Oop. An avid cook with nine ovens in his home kitchen, Binson says the house is another repository for art, including a few carved wooden horses that once adorned merry-go-rounds. “We’ve had a lot of fundraisers at the house, and the kitchen is what I like to call my playground,” he says, thumbing through his accumulation of knives, fishing lures, and ice-cream scoops.